Skores includes all the matches on the calendars of more than 5000 football competitions around the world. 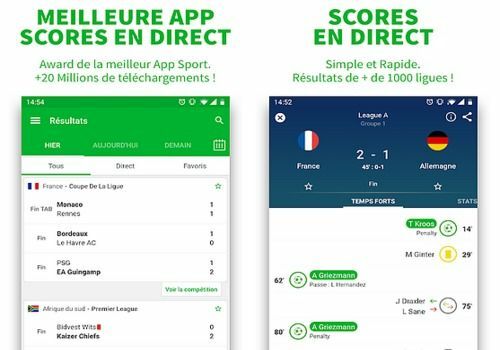 The free application informs you live on the highlights of the matches you are following (goals, cards, changes) thanks to its alert system. All matches are classified by geographical area.Simply select the area you are interested in to access the results. If you were unable to follow the matches live, the app offers you a catch-up session with videos of the highlights of the big matches by offering you Youtube or Dailymotion links. It is also a very good tool with which you can refine your predictions since it provides detailed statistics on teams. A few months before the 2018 World Cup in Russia, many collectors are competing for Panini thumbnail albums. This year your magazine invites you to visit your Android terminal and discover all the thumbnails in the collection. LFP Android is the official application of the Professional Football League. Rich in features, it provides access to all the latest news from League 1 and League 2, but also to live matches. Downloadable free of charge on smartphone and tablet, it is the essential for footeers. Panini Sticker Album iOS is an application available on iPhone and iPad that offers you the collection of cards of players who will participate in the 2018 World Cup in Russia. Onefootball is an application that allows you to follow all the latest football news on your smartphone (score, transfer news, etc. ).